After living in rough in Pongobamba for so long, we decided to treat ourselves to the fancy seats on the trip to Lima so we’d be able to get some sleep. It was to no avail. We discovered the route from Cusco to Lima is one 21hr stretch of contiguous hairpin corners as the road winds up the mountains, and down, and up. During the daylight hours the stunning scenery was was worth the stiff neck, but it made it very hard to sleep at night. Thus we arrived in the morning quite tired, but managed to find ourselves a room to stay in downtown Lima. The place, Hotel Espana was wacky, filled with old paintings, busts, spiral staircases, talking parrots and tortoises. We didn’t have time to relax however, as there was a lot of Lima to see and only 2 days to see it. After dumping our bags we took a taxi across town to meet up with our American friends Brett and Emily in the outlying suburb of Barranco. While Lima central was very hectic, Barranco was a much more relaxed neighbourhood by the coast. We spent a couple of hours walking along the coast, which was very hazy and not too appealing. At one stage we wondered into a big shopping mall which was an instant reminder of how dirty and smelly and in need of a shower we were. Later on and the next day we did our best to explore central Lima. To be honest, I was not really looking forward to Lima, having being told it was dirty, busy, smoggy and dangerous. Though the city is under a perpetual hazy white sky, and has some of the most hectic traffic I’ve ever come across, we did not feel under threat at all, in fact the people we spoke to were some of the friendlies we’d met in Peru. One particularly funny chap, a security guard at one of the churches, was learning English and after a short chat, insisted “I want to tell you yust one yoke”. I can’t remember how the yoke went, but it was hilarious anyway. There was plenty of interesting things about to keep us busy including the churches and monasteries, shops, the huge central market, where everything and anything is available, Chinatown and of course numerous different delicious and very cheap street snacks to try. We really enjoyed our short stay in Lima and it was all too soon that we were saying goodbye to all the delicious and cheap snack vendors of South America and catching one last insane cab ride to the airport. At the airport we marvelled not only at running taps, but automatic soap squirters! It was a small taste of the first world. Next stop, Houston Texas, followed quickly by Las Vegas Nevada. Just before our trek we had met up with a couch surfer in Cusco and he had told us about his home in Chinchero, a small town just outside of Cusco. There he has set up a Albergue, a centre where the local school kids go for extra curricular learning, and where we would be able stay and to help out. We have been on the lookout for some kind of volunteering work our entire trip but most “volunteering” nowadays seems to be through big companies and for some reason involves you paying them a substantial amount of money. This was directly through a local person, helping local people with no big white land cruisers involve. So, after a day of recovery after the trek, we excitedly met up with Ermo and were soon watching anxiously as our now huge backpacks were tossed onto the roof of a local bus. A couple hours later we arrived in what was to be our home for the next few days, the little community of Pongobamba. It consists of little more than the school and a few dirt roads, lined with the most delightfully rustic mud brick houses. Like Isla del Sol, the silence of the place was striking. It was only broken every now and then by the laughing of children, the snuffling of the pigs in the gutters and the crazy braying of mules and donkeys. Our lodgings were set on a hill looking out over the Laguna Piuray and the mountains beyond. Behind it were miles and miles of rolling fields. The buildings themselves were surprisingly modern in construction, but this was slightly deceptive as we soon found out that the water was not working. Our first task was to walk down the hill to Ermo’s mothers house to fetch some water, then lug it back up the hill to our kitchen. According to Ermo the the water would soon be working again. With that promise he returned to Cusco, leaving us to make ourselves comfortable. After Cusco, the solitude was wonderful and with relish we set about cooking what was our first home cooked meal for a long time. The following afternoon Ermo had not retured, as he said he would, and the local children had arrived to find a panicing Sophie. I had gone to explore some nearby towns so Soph was left on her own to try and handle the arrival of about 10 local kids of various ages, only a few of whom could speak Spanish, let alone English. I arrived back to find her engaged in teaching a very basic English lesson. It very quickly dawned on us that we would have to cut back our expectations of the amount that we’d be able to teach the kids. With such a big language barrier, gone were Soph’s plans of imparting repect for the environment and each other, and the desire to create a better world. Instead we concentrated on topics such as; names of farm animals and ingredients of a chocolate cake . Despite that, it wasstill a very interesting experience working with the kids and trying to come up with things they could do. In the end we did some art, some music, some English, and for the big finale on the last night, we got all the kids to help out to make a huge chocolate cake, which we very promptly devoured. 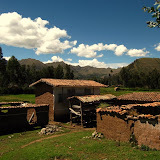 During days when the kids weren’t there, we spent the time exploring the nearby towns in the Sacred valley. For a tiny fare, we were able to zip between the very interesting towns of Chincero, Urubamba, Ollantaytambo and Pisac on the local buses and taxis, often packed to the brim with locals going about their daily business. 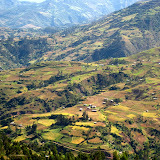 All the of the towns had a huge amount of character and history, most of them being former Inca towns. The scenery in the area is just fantastic, with rolling plains dropping dramatically down into the valley and then rising up to the snow capped mountains on the other side. It was a spectacular place to stay, but hard work as well. The water never did reappear, so all of the tasks involving the running water that we take so much for granted became very tedious. Washing up, cleaning floors, making tea, flushing toilets, now all relied on us having water in the 20l container that we’d have to lug 300m up the hill. In addition, we became quite friendly with Ermo’s mum, and the one day she managed to rope us into coming out into the fields with her to harvest some potatoes. While really hard work, it was an amazing experience of rural Peruvian life. The day began with everyone gathered round having a few capfuls of Quanyasa, the local (very local in fact, probably brewed by one of the guys) cane spirit. Then the ox-plough did a first pass to rip up the rows of earth, quickly followed by us, bent double, sorting through the clots of earth to find the potatoes and tossing them into a carrying cloth. When full, someone would wrap them up and take them to the waiting sacks. At tea time we all gathered again and sat down in a circle. A 20l container of the traditional beer, Chicha, was opened with a big pop and in turn it was passed to each. It was warm and very tart, not unlike the traditional brew of Zimbabwe, Chibuku, except mercifully much less thick and lumpy. After everyone had had their fill it was back to work. While we worked, a couple of the guys built what looked like an oven from large clots of earth from the field. Inside, a big fire was lit, and after letting it burn for half an hour or so, some of the potatoes we’d just dug were placed in the oven, and it was collapsed on top of them. Thus, after the second session we feasted on super fresh, ground baked potatoes, seasoned with salt and a chillie and cheese concoction with salad. Never have potatoes tasted so good! That evening after our classes we were rewarded for our labors with a huge pile of potatoes, much more than we could possibly eat in the couple of remaining days. We did our best though, cooking many of them with the kids on the final night. Such was our week in rural Peru. It wasn’t easy, but it was an unforgettable experience that you simply cannot sign up for at your local travel agent. We returned to have one night in Cusco where we were desperate to have a shower that didn’t come out of a bucket, and where we had a new appreciation for the fact that water just comes out of the taps simply by turning the knob. The next day we had one more delicious and cheap Cusco restaurant meal, before we boarded a 21hr bus for the capital, Lima. Cusco, capital of tourism in Peru, is a beautiful town, set in a valley with hills rising up all around. Once the capital of the Inca Empire the city is packed with ruins and remains from Inca days, even though the Spanish did their best to build over them. Many of the streets and building fountains are original Inca construction. The main plaza is stunning, bordered by amazing cathedrals on two sides and charming old buildings on the others. There is no question of Cusco’s status as the tourist capital of Peru (maybe even the entire world!). Just walking across the plaza one is absolutely bombarded with offers of wool gloves, beanies, socks, shoe shines, massages, drugs, tours and more. By the time you reach the other side your voice is hoarse from saying “no gracias” so many times. On the up side though, the glut of tourists seems to have driven all of the restaurants to compete themselves into offering meals at the most amazing prices. In Peru one can always find the ol’ quarter chicken, rice and chips for dirt cheap, but in Cusco we found some really delicious, as well as nicely presented, three course meals for as little as 7 Sols (US$3). A similar situation exists with the bars. On the one night we went out in Cusco we were swamped with guys literally forcing free drinks tickets into our hands trying to get us into their bars. All you have to do is bar hop everytime you need another drink, no wallet required. When you run out of bars, just head back to the first. Needless to say, we had a pretty drunken and fun night. 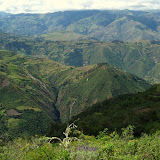 There is plenty to see in Cusco and the surrounding areas, however to do so one requires the “Boleto Touristico”. This diabolical tourist trapping invention is a multipass ticket costing a whopping US$50 (thats a pretty whopping price for anything in Peru). It grants entry (only one entry though) to all of the must see sights around Cusco and the sacred valley, however the catch is it only lasts 10 days, so you have to be pretty deteremined to see them all in this time. Additionally, if you only want to, or have time to see only one or two, thats too bad, because the ticket is the only way to get into most sights. So after much grumbling and gnashing of teeth, we eventually had to fork out the cash for our tickets. Of course some of the sights were amazing, such as Saqsayhuaman, a huge fortress built of carved rocks, some over a hundred tonnes in weight. Others were not as impressive, having only a couple of walls left, not really worth it after you’ve seen some of the more impressive ones. Our first day was spent meeting up with our mates from the Uyuni trip, Brett and Emily, to organise our trip to the main attraction of the area, Macchu Piccu. Luckily for us they had got there before us and had already done most of the research for us. All we had to do was draw some money and sign up. 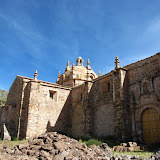 Although most people have only heard of the very expensive and difficult to book “Inca Trail”, there are actually many other options for reaching the site. The one we eventually settled on was the Salkantay trek, a five day 4 night trek of about 80km. With excitement we awaited our 4am bus pickup to the starting point of the trek. Just prior to heading off on our Titicaca island tour, we were pressured by the machine into signing up and putting a deposit on the next leg of our trip, The “First Class” bus tour to Cusco. This “tour” is an all day bus trip to Cusco, complete with multilingual guides and a few stops at select tourist destinations. Of course its over 3 times the price of the simple overnight bus trip to Cusco. So we had the 2 days island trip to think about whether this was good value for money or not, but since we’d already given up a deposit, when we got back to Puno we had no choice. If we weren’t already regretting our decision, we were soon informed that the entry cost to all the of sites we’d be visiting wasn’t included. So off we went. The seats certainly weren’t anything special, but the guides were quite interesting, the ruins at Raqchi were quite impressive, and the church in Andahuaylillas was amazing, painted wall to wall with old frescos. Needless to say at all the stops was a wall of handicraft stalls, waiting to eat up all the tourists. A nice lunch was included, although for that day I was suffereing from some severe tummy unhappiness so was in no position to enjoy lunch, or that day in general. Coming up to Cusco we were treated to some amazing mountain scenery, with large potions of the steep slopes somehow being used to grow various crops. 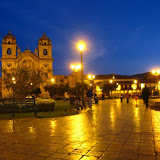 We arrived in Cusco in the evening and I sat in the beautiful main Plaza in a state of extreme discomfort while Sophie went to look up a hostel. Then it was a sprint to the hostel for me to relieve my bowels. After an hour or so on the can I could finally appreciate the fact that we’d made it to Cusco. Adventures of Dean and Sophie is powered by	WordPress 2.8.5 and delivered to you in 0.361 seconds using 33 queries.